Adult Description: The tawny crazy ant, called "crazy" for how they rapidly and randomly move about, are medium-small, 2.6-3 mm long, monomorphic, golden-brown to reddish-brown ants that have a smooth and glossy body surface, covered with dense hairs. Worker ants have long legs and antennae and their bodies have numerous, long, coarse hairs (macrosetae). Their heads are shiny, sparsely pubescent, and subcordate. The antennae have 12-segments with no club, and their antennal scape is nearly twice the width of the head. After feeding, the ant's gaster (portion of the rear abdomen) will appear to be striped due to stretching of the light-colored membrane connecting the segments of the gaster. Its mesosoma (thorax), more importantly the mesonotum and mesopleuron, are densely pubescent with long, paired light-brown hairs (macrosetae). There is a small circle of hairs, called the acidopore, present at the tip of the abdomen, as opposed to the typical stinger found in most ants, a characteristic of formicine ants. The Tawny crazy ant is a social insect that is usually found in extremely large numbers and lives in large colonies or groups of colonies that seem to be indistinguishable from one another. Aside from the worker ants, the reproductive males of the tawny crazy ant are similar in color and size but possess wings. Males are needed to distinguish N. fulva from N. pubens using the shape of the parameres (external reproductive organs of male insects). Nylanderia fulva have parameres that are more triangular, less sclerotized, and possess fewer macrosetae than N. pubens. Queens are larger and darker brown, usually found wingless, and are responsible for producing the millions of larvae within the colony. Larva Description: Pupae are "naked" or without cocoons. They periodically produce winged males and female forms called sexuals or reproductives. There can be an extraordinary amount of brood within any one colony of tawny crazy ants. Sometimes colonies are so large that the individuals are indistinguishable from those of neighboring colonies and a "super colony" may result with tremendous population densities. The exact impact of the tawny crazy ant on the local ecology is currently unknown, but anecdotal evidence suggests that N. fulva is displacing both native and non-native ant species, and negative impacts on other vertebrates and invertebrates are likely. Nylanderia fulva has been a serious pest in rural and urban areas of Colombia and South America. In this case, they reportedly displaced all other ant species and caused small livestock (e.g. chickens) to die of asphyxia. Larger animals, such as cattle, were attacked around the eyes, nasal fossae and hooves. The ants also caused grasslands to dry out (desiccate) because of the ant’s symbiotic relationship with sucking insect pests (hemipterans). The ants feed on the sugary "honeydew" produced by these plant feeding insects and, in exchange, provide protection from other predators. Masses of crazy ants covering the ground and trees likely affect ground and tree-nesting birds and other small animals and may cause wildlife to move out of the area. These ants are even displacing red imported fire ants in areas of heavy infestation. Ironically, after experiencing the tawny crazy ant, most residents prefer the fire ant! -Electrical equipment: In areas infested by the tawny crazy ant, large numbers of ants have accumulated in electrical equipment, causing short circuits and clogging switching mechanisms and equipment failure. -Agriculture: These ants show the likelihood of being transported through movement of almost any infested container or material. Thus, movement of garbage, yard debris, bags, loads of compost, potted plants, and bales of hay can transport these ant colonies by truck, railroad, and airplane. Indirect damage to crops may occur due to symbiosis with hemiteran insects and the tawny crazy ant has demonstrated the ability to translocate pathogenic organisms. -Humans: Tawny crazy ants do not have stingers. In place of a stinger, worker ants possess an acidopore out the end of the abdomen, which can excrete formic acid for defense or attack. They are capable of biting, and when bitten, they cause a relatively sharp pain that quickly fades. McDonald (2012) showed that the tawny crazy ant has the ability to translocate pathogenic organisms. No mating (nuptial) flights have been observed in the field, despite the periodic development of winged male and female ants, called sexuals or reproductives. This indicates that colonies most likely spread or propagate by "budding" with breeding occurring at/near the edge of the nest, creating new colonies at the periphery. Annual rate of spread by ground migration is ~20 and ~30 m/month in neighborhoods and industrial areas, respectively (Meyers 2008), and 207.4 m/yr in rural landscapes (McDonald 2012). The tawny crazy ant is an incredibly aggressive and destructive pest species. They are known to rapidly colonize and take over various habitats, including human-built establishments. Homeowners fear infestations because eradication is nearly impossible once a colony has been formed. The tawny crazy ant was first discovered near Houston, Texas in 2002 by Tom Rasberry (hence the alternative common name Rasberry crazy ant), a pest management professional. The ant quickly turned into a problem for local residents and businesses infiltrating homes and destroying electrical work. Even NASA called on Rasberry and others in order to eradicate the ant from electrical wiring at NASA facilities. The ant is believed to have traveled to the U.S. aboard a commercial ship, probably from South America. Their exact means of entry are unknown, but precautions are being taken to avoid the spread of the tawny crazy ants. U.S. Present: The Tawny crazy ant has only been found in the state of Texas (near Pasadena) since 2002. High densities of these ants have been documented in localized spot infestations in southeast Houston (Harris County), including Houston, Pasadena, Deer Park, Friendswood, San Jacinto Port, Pearland, Seabrook, La Porte, Texas City, La Marque, and Dickenson. 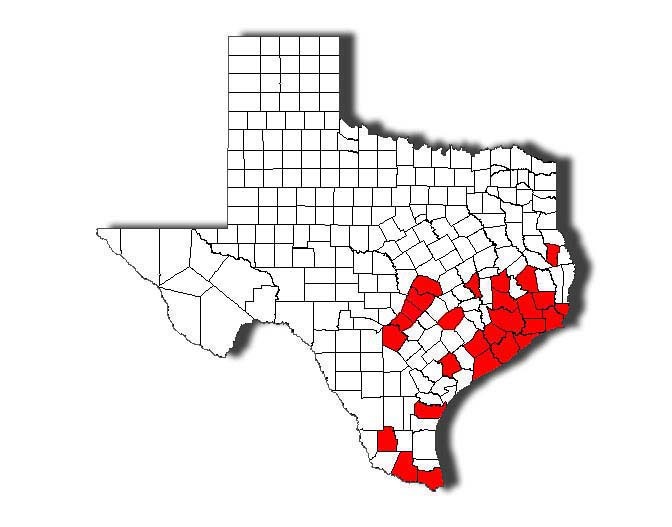 Additional localized infestations have also been confirmed from areas in Bexar, Brazoria, Brazos, Cameron, Chambers, Comal, Fayette, Fort Bend, Galveston, Hardin, Harris, Hays, Hidalgo, Jefferson, Jim Hogg, Liberty, Matagorda, Montgomery, Nueces, Polk, Orange, San Augustine, Travis, Victoria, Walker, Wharton and Williamson counties. New infestations are suspected beyond these areas. However, sample identifications have not been confirmed. This ant has the potential to spread well beyond the current range in coastal Texas. This is a semi-tropical ant and potential northern distribution will be limited by cooler weather conditions. U.S. Habitat: Tawny crazy ants are omnivorous, but prefer a liquid carbohydrate based diet (McDonald 2012). Worker ants commonly "tend" sucking hemipterous insects such as aphids, scale insects, whiteflies, mealybugs, and others that excrete a sugary (carbohydrate) liquid called "honeydew" extracted from host plants. Workers are also attracted to sweet parts of plants including nectaries, damaged, and over-ripe fruit. Their protein source includes other insects or small arthropods. Nylanderia pubens, the hairy/Caribbean crazy ant, can be found in Neotropical regions, particularly in the West Indies and possibly Florida (Gotzek et al. 2012). These two ant species are indistinguishable using morphological characteristics of workers and can only be separated using by comparing the parameres of males. Many of the typical control tactics for other ants do not provide adequate control of the tawny crazy ant. Because colonies predominantly nest outdoors, reliance on indoor treatments (see YouTube Video) to control these ants foraging inside structures is not effective. Cultural control: At the foundation of any IPM strategy are cultural control methods beginning with the removal of harborage such as fallen limbs, rocks, leaf litter, and just about anything sitting on the ground that isn't absolutely necessary. Cultural methods can also include altering the moisture conditions in a landscape. Crazy ants prefer humid, wet conditions so reducing the amount of irrigation, repairing leaks, and improving drainage should help. Avoid spreading this species to new locations: Anything being moved from an infested area should be inspected for ants and treated before transferring it to a new site. Food sources should be eliminated or managed. Specifically honeydew producing hemipterans should be managed. Often, products containing the active ingredient imidaloprid or other systemic neonicotinoid are a good option for hempiterans. Chemical control: Effective products involved with the treatments are not readily available to the consumer**. If you suspect your house or property is infested with these ants, call a professional pest control provider. After treatment, or when making multiple applications over time, piles of dead ants must be swept or moved out of the area in order to treat the surface(s) underneath. Tawny crazy ant workers are not attracted to most bait products (see B-6099, "Broadcast Baits for Fire Ant Control") and the most attractive product they are attracted to (Whitmire Advance Carpenter Ant Bait formulation containing abamectin (Label and MSDS), does not offer enough control as a standalone treatment, and should be used in conjunction with contact insecticides (McDonald 2012). Maxforce® Granular Insect Bait is also highly attractive but has yet to be tested in the field. There are treatments available for this ant that offer temporary "buffer zones" using contact insecticides applied to surfaces, such as those containing acephate, pyrethroid insecticides (bifenthrin, cypermethrin, cyfluthrin, deltamethrin, lambda-cyhalothin, permethrin, s-fenvalerate, and others) or fipronil. These treatments are often breeched within 2-3 months post application. Pest management professionals need access to an entire infestation in order to achieve an acceptable level of management. Otherwise, the population will rebound from surrounding, untreated sites within a month. **Note for Professional Pest Management Personnel: According to the Texas Department of Agriculture, the following products have received expanded use approval through a Section 18 Quarantine Exemption from the Texas Department of Agriculture (TDA) and the Environmental Protection Agency (EPA) for the control of these ants. These are only available for use in counties with confirmed infestations of the tawny crazy ant. See product labels and supplemental labels for specific use directions: This exemption will expire on November 1, 2015. Please report any sightings to TISI along with specimens collected. To submit a sample please fill out the form and follow the mailing instructions attached here. Gotzek, D., S. G. Brady, and R. J. L. Kallal, John S. (2012). The importance of using multiple approaches for identifying emerging invasive species: the case of the Rasberry crazy ant in the United States. PLoS ONE 7: 1-10. Kallal, R. J., and J. S. LaPolla. 2012. Monograph of Nylanderia (Hymenoptera: Formicidae) of the Wold, Part II: Nylanderia in the Nearctic. Zootaxa 3508: 1-64. MacGown. J., B. Layton. (2009). The Invasive Rasberry Crazy Ant, Nylanderia sp. Near pubens (Hymenoptera: Formicidae), Reported from Mississippi. Midsouth Entomologist. 3 : 44-47. McDonald, D. L. (2012). Investigation of an invasive ant species: Nylanderia fulva colony extraction, management, diet preference, fecundity, and mechanical vector potential. Ph.D. Dissertation, Texas A&M University College Station, TX.